Snowmen and ice skating penguins! Such fun. This Christmas snow cake was for my sister in law’s annual Christmas bash. It was huge(16×16) and weighed a ton. I made everything on it out of fondant except the rocks, which are made of chocolate and look so great. 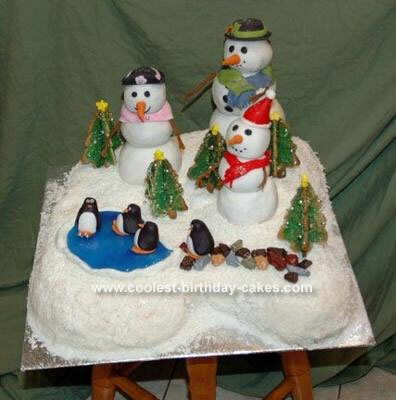 The snowmen were made from rice krispies and covered with fondant. The lake is made from sugar and the trees were cookies. It was a huge hit, and no one wanted to cut into it. My father in law was the first, he tore the head from the snow daddy and that was it, dessert was finally served! Awesome job….you are so talented. Congratulations on this gorgeous cake!! It is beautiful! Very creative.. nice!! I was just surfing around looking for gum paste snowmen so I can try and make some.. love the scarves… thanks for sharing!